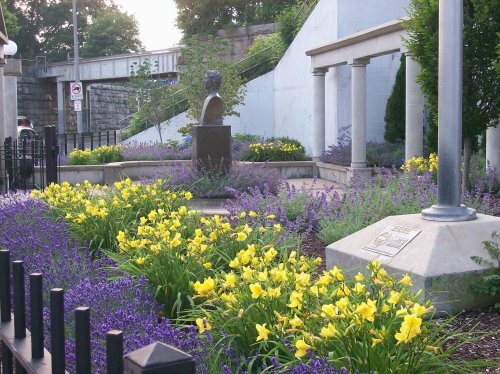 Roslindale Green & Clean redesigned and planted Alexander the Great Park in Roslindale Village. Working with our partners, St. Nectarios Church and Roslindale Village Main Street, it took almost an entire year to design, conduct public meetings, and plant the previously spare and underutilized public space. The planting was completed in May, 2007. The design of the park was influenced by several factors. The park serves as a gateway to the neighborhood, and RG&C wanted it to be welcoming to those passing by in automobiles as well as to pedestrians. Because the park has been maintained by St. Nectarios Church and the Greek Spirit Committee and because a statue of Alexander the Great is prominently featured at the entrance, the RG&C Design Committee envisioned a space with a Mediterranean feeling. The large arborvitae and the hornbeam trees were chosen to capture the shapes associated with trees in the Mediterranean region. RG&C also wanted the park to be low maintenance, drought tolerant, and have horticultural interest in all four seasons. The palette of plants chosen for the park repeats what RG&C has planted elsewhere around Roslindale Village. This continuity of design helps to create a sense of place. Because the park has a southern exposure, and is walled in concrete, seven trees (three hornbeams and four dogwoods) were prominently planted to give the garden structure, shade, and a sense of intimacy. Four large arborvitae give form to the background, and boxwoods line the perimeter. Hydrangea ‘Endless Summer’, Catnip ‘Walker’s Low’ and Daylilies ‘Happy Returns’ fill the area around the trees, while Lavender ‘Hidcote’ lines the fence line along the sidewalk. After clearing the site in April, paid interns and many volunteers did the planting on the last day of May. St. Nectarios Church and the Greek Spirit Committee donated the installation of an irrigation system for ease of watering. The Arnold Arboretum donated 10 cubic yards of mulch that will help to retain moisture and suppress weed growth. In 2017, the hillside between the park and the stairs to the Roslindale Village T station were cleared of noxious weeds which were replaced with a planting of ‘Gro-Low’ sumacs. These tough natives will prevent soil erosion and provide rich green summer growth and red and orange fall color. A graphic which includes the plan for the park and the full plant palette is available here.